Is Coach Inc. Stock a Buy? The luxury handbag maker's shares have dropped significantly, but that doesn't mean its stock should be in your portfolio. Stepping up in the world of luxury is not so easy when the well-to-do see you as bourgeois. 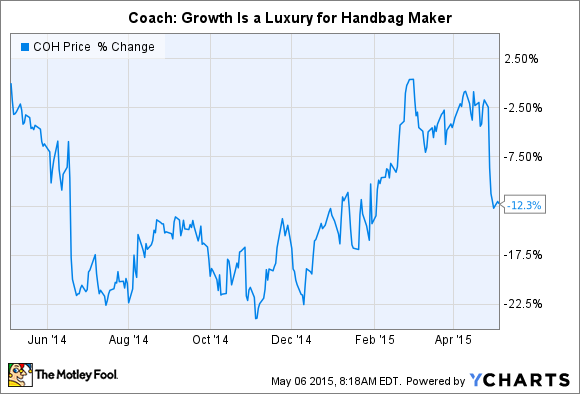 Handbag maker Coach (NYSE:TPR) has fallen hard as its plans to regain its luxury appeal have not made much headway. After several straight quarters of beating forecasts, revenue missed estimates in the fiscal third quarter while EPS was in-line with estimates, as comparable sales remain in free fall. Yet through it all, management is buoyant about Coach's prospects for connecting with consumers. With the air let out of the retailer's once-soaring stock, investors are right to wonder whether now is a good time to jump in. Here are a few things investors should keep in mind as they ponder Coach. Coach 1 Year Stock Chart, data by YCharts. Coach's hallmark across the decades has always been "accessible luxury": premium leather goods for the well-to-do consumer aspiring to make it even higher in the world. Somewhere along the way, Coach got the notion that wasn't good enough anymore. Its brand had become too ubiquitous, there was no longer any cachet associated with the double-C logo, factory outlet stores had undercut the premiums served up at its full-price retail stores, and sales were falling. The handbag maker to decide it needed a change. While as recently as 2013, handbags costing over $400 represented just 18% of Coach's total handbag sales, in the latest quarter they stood north of 30%. Coach closed out fiscal 2013 with $5.1 billion in sales; sales over the last 12 months were below $4.5 billion and the trend is heading further in the wrong direction. Fiscal third-quarter net sales of $929 million were down 15% from the $1.1 billion generated last year and missed analysts' forgiving estimate of $949 million. By scaling up its offerings to attract an even more well-heeled clientele, Coach is pricing itself above the comfort level of its core customer. Being logo-heavy was not a benefit and Coach ended up sharply paring back its "double-C" trademark. For the first time in six quarters, Coach's gross margin rose in the recently ended third quarter. All those pricier goods at least started paying off with beefier profits, right? No. Coach drove up its gross margin by slashing promotions to just a handful of sales, but the improvement was minimal -- to 71.6% from 71.1% a year ago. Coach is targeting a 69%-70% gross margin for the year, above what it earned last year (68%) but still well below its prior low-70s rate of just a few years back. Moreover, gains higher up on the financial statement aren't trickling down. Operating margin has collapsed to about 18% from 23% last year and 30% or more in the years before that. And net margin is barely staying in the double-digit range after being well above 20% in prior years. Coach's Q3 EPS of $0.36 almost missed the generously low forecast of $0.35 and was cut by more than half from the year-ago period. Coach eliminated sales to protect the brand, which should have bolstered profitability, but revenue has plunged such that expenses related to transforming into its new, pricier image have increased as a percentage of sales. Selling, general, and administrative costs were 55.8% of revenue in the third quarter compared to 47.2% last year. The higher price points are also discouraging customers from even entering its stores, let alone buying anything when they come in. Although traffic improved somewhat from the second quarter, it's still negative overall, though Coach wants to share the blame for the drop with a "secular decline" in mall traffic. A Cushman & Wakefield report on mall traffic based on ShopperTrak data found that between 2010 and 2013, consumers' trips to the mall during the two busiest months of the year -- November and December -- plunged 50%, from 35 billion to 17.3 billion. They were down another 11% in November and 7% in December last year. Obviously, many of those visits have moved to the Internet. That hasn't helped Coach, though, as its online outlet site cannibalized sales from its retail stores to the tune of about 1,100 basis points this past quarter. And though international sales are also a key component of Coach's business -- and they were somewhat better than U.S. sales this quarter -- even sales in those foreign markets declined sharply year over year. So what does an investor have to pay to own a modern luxury retailer? According to data from Morningstar, Coach shares are valued at 17.6 times next year's estimated earnings, only a negligible discount against the average 18.8 times forward earnings multiple of a group of comparable companies that includes LVMH Moet Hennessy Louis Vuitton, Compagnie Financiere Richemont, and Michael Kors. With the S&P 500 itself trading at 18.5 times forward earnings, the slight discount to own Coach stock -- with its business still in turmoil -- is not a reasonable risk to take. Considering the hurdles the company still faces, it's difficult to say it's a good bet to beat the market -- or its luxury peers -- over the next three to five years.